Peel, core, and dice the Apple Pears and apples into 1 inch chunks and place in a non-reactive saucepan, along with the apple juice and cook on low for 30 minutes, until tender. Using a hand immersion blender, blend until smooth. Season with cinnamon and nutmeg and add it to the crockpot. Heat on high with no lid for 2 -3 hours, stirring every 30-40 minutes until liquid has evaporated and it has cooked down into a thick butter/paste. Serve over toast or pancakes for breakfast. I received a request on our Facebook page for an Apple Pear jam recipe. I haven't ever attempted jam with our pears before (I would love to hear from anyone who has though!) 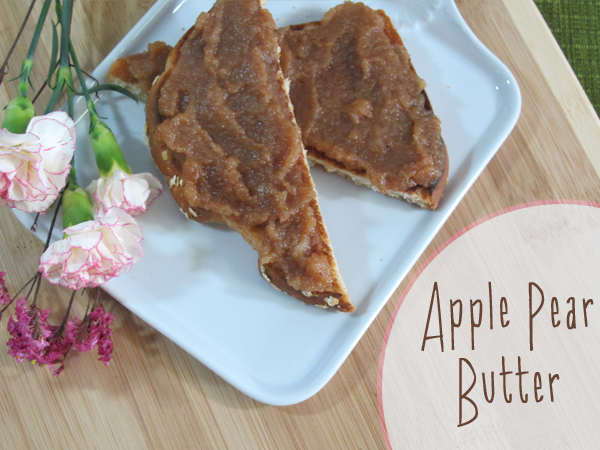 I did make an Apple Pear butter a few years back, so I am sharing it here. I only made it the one time, and it was used up quickly, so I'm not sure how long it would last if canned properly. Hope you enjoy it! Place diced Apple Pears and cider into a non-reactive saucepan, cover, and cook over low heat for 30 minutes or until soft. Drain and cool. In a food processor or blender, puree the cooked Apple Pears. This may need to be done in a few batches. Pour into a 9x13 baking dish and season with cinnamon and nutmeg. Stir well. Bake at 300° for 2-3 hours, stirring every 20 minutes until the Apple Pear butter is thick and deep brown in color.